"Thank you again for your helpful, and down-to-earth approach to such a difficult subject." "Your enthusiasm and humor greatly improved the overall experience and the interactivity of this program and participation among the audience retained their interest." "Karen's program provides terrific insight to improve the impact and effectiveness of communication with your co-workers, customers and friends. She delivers it in a warm and energetic style that connects with the audience and makes her program as much fun as it is educational." "I found your presentations to be inspiring. Your energy was boundless, your enthusiasm and humor compelling." "We appreciate the time you took to tailor your presentation to our audience as well as your enthusiasm and solid content." "I think she is fabulous. Her presentation is very high energy, but focused. She is very easy to work with." Welcome! Imagine a speaker who provides inspiring, interactive programs filled with proven, research-based, relevant material and immediate take-aways. Visualize your audience energized, laughing and participating. 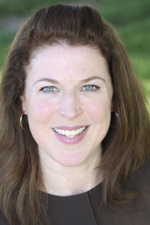 Award winning, Las Vegas-based speaker Karen E. Purves M.A. has built a solid client base providing these results for over 15 years! Effective communication is essential for success. In the last decade neuroscience has made incredible strides in understanding how what we hear people say to us, affects our brains, and therefore our responses. As a communications expert specializing in how language affects emotional centers in the brain, Karen shares immediately usable tips for communication via email, phone and in person, both internally with staff or externally for customer service, sales or marketing. Available Soon! The Language of Results - Using the Power of Emotion to Improve Relationships - Are you unintentionally turning away new business and revenue? Do you have unresponsive or difficult coworkers? Are people holding up the information you need to do your job? Karen is one of a handful of people in the US having completed advanced/specialized coursework in Interpersonal Neurobiology, and with knowledge in affective neuroscience - the physiology of emotion. In this program she reveals simple, concrete solutions to accelerate your connection with others. These proven best practices can be applied immediately and in day-to-day conversations. You’ll leave the session knowing specifically how to connect with others to enhance your success. Recently Updated! Communicate With Strength - Key Words That Undermine Your Effectiveness - Got the right words? Laugh and learn in this session filled with the latest solutions in effective communication, based on neuroscience principles. What are you saying that’s causing your staff and clients to subtly feel uncooperative or defensive? Karen will tell you - and give you replacement words and phrases. Leave with an immediate, specific, action plan. When this session has been offered to sales people, after participating in this program attendees, on average, said their ability to better communicate in the sales process improved 34%. Recently Updated! This is How You Do It – Proven Secrets to Email Etiquette - Do you know the four letter word that instantly increases the response rate to your emails? Find out the answer while participating in this cutting edge, jam packed, interactive session filled with proven email tips. You’ll learn easy, time-saving solutions to help ensure others open, read and respond to your emails, as well as how Karen gets over a 90% response rate to her emails. After participating in this program attendees, on average, said their ability to write a more effective email improved 74%. Recently Updated! Wag More, Bark Less - Reducing Negativity in the Workplace - Deal with difficult people? Spend too much of your day handling personality conflicts among staff? Explore 14 different ways people express negativity and learn a tip for dealing with each one. You’ll learn effective skills on handling a broad spectrum of negative personality styles - and see how you can adjust your own attitude to help stay positive and improve organizational excellence! Receive tips on exactly what to say to whom, so you can go back to work and do something different immediately. After participating in this program attendees, on average, said their ability to handle negative situations in the workplace improved 28%. Words that Matter – Creating a Charismatic Connection - Want to improve your language skills and speak with more power? Identify conscious communication solutions to tap into better results. Learn from a communication expert new, fresh, examples of words to use for maximum effectiveness in business success. Karen creates programs that excite your brain for optimal learning, and shares simple, concrete language choices that improve bottom line results. Discover key words and phrases to remove or reduce in your vocabulary to increase your influence with colleagues, potential and current clients. Take away practical tips to use immediately! Gender Matters – Effectively Influencing Men Differently Than Women - Karen pairs her relatable, funny and energetic style with her original scientific research to offer attendees a unique, current, content-rich program on maximizing buy-in from men and women on procedures, products and services. This session offers the latest in cutting edge brain science and answers your questions on the best way to influence men and women. Audience members will leave with 12 techniques to apply immediately to thrive in a challenging economy! It's a Jungle in Here – Thriving in Uncertain Times - In this engaging and interactive program, attendees discover fresh ideas on how to increase their value in an organization by utilizing a plan to go from “idea to implementation” in four easy steps. This humorous yet practical program weaves vivid stories along with providing take home tools. Participants will learn the three principal reasons others don’t support their ideas, discover the critical importance of understanding learning styles, and leave with communication tools to use immediately to increase their influence. Karen provides real world examples of proven tactics in an enthusiastic setting that can be put to immediate use for success! Building Rapport – Developing Authentic Relationships - Are you surrounded by people who exhibit an attitude of indifference or apathy? 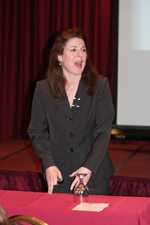 Karen brings her trademark humor and energy to actively engage the audience during her program. Become up to date on the latest tactics to accelerate your ability to connect with others through formulas on effective listening, inquiry and empathy. Discover how to proactively generate productive and engaging conversations to create and sustain relationships with others. You’ll receive immediately usable solutions with direct relevance to your organization! Truce Among Tribes – Developing effective conflict resolution strategies - How confident do you feel at handling the “tough conversations”? This acclaimed, no-nonsense workshop helps participants unlock their potential by learning valuable problem-solving strategies for conflict resolution, then gives attendees instant feedback by allowing them to role play using real-life examples and receive insight on their individual conflict resolution style. This time-tested program takes the guesswork out of handling conflict situations. Topics explored include: causes of conflict, the costs of conflict, a proven 5-step plan to better handle conflict and/or difficult employees, how to resolve conflicts with power, clarity and tact and five inhibitors to listening. Attendees will leave empowered to implement new tactics to build cohesiveness and improved relationships. True Leadership – Discover new realities for leaders in the 21st century - Effective leadership may determine the future of your business. A study by Hewitt Associates found “a conclusive link between a company’s leadership practices and enhanced financial returns.” Join this fast-paced, revealing workshop and learn the essential five steps mastered by proven leaders. Unconventional components of this program include practicing improvisational skills and recognizing how this knowledge directly relates to charismatic and competent leaders. Attendees will leave with tools to: focus their energy for maximum effectiveness, build remarkable relationships, improve listening skills, and create a plan to implement in their workplace. Flying like Geese - Improving teambuilding in your workplace - Are you getting the best out of your team? This participative program offers attendees opportunities to improve communication and trust, increase collaboration and cooperation, pinpoint ideas for diffusing stress, get to know one another better through improv games, and identify specific improvements for new ways of working together. The results of this session include employees leaving with tips to apply to build successful working relationships and partner together more effectively, ultimately allowing for improved synergy and productivity. Becoming a Lie Spy – Clues if someone's being honest - Want to better understand human behavior and help identify when people behave in a trustworthy manner? There’s a science to decoding unconscious behaviors and you can hone your observational skills to help you, and others, act with integrity. This innovative and engaging program shares numerous, practical, insider tips to identify cues and gain insight on human behavior. You’ll leave better able to gather information and trust your judgment about someone’s behavior to reduce deception. Karen shares specific steps to get to the truth, preventing costly mistakes, increasing positive outcomes and allowing you to make better decisions! Karen offers this guarantee: in any program you choose, she’ll offer useful material in an engaging way with immediately usable information. Karen offers a range of fees to meet most budgets. After a telephone call to assess your program goals, you'll receive a written quote. It's very important to me that I provide you with at least one option that meets your budget needs so kindly call 702-724-4912 or email karen@innovativeimpact.com with your inquiry. I look forward to the opportunity to bring value to your event!